Lake Tahoe is one of the most beautiful places in California to visit and a must see vacation destination for travellers all over the world. While the winters have been mildlately there is nothing that can take away from the beauty of the lake, especially when seen from a mountain top. With over a dozen ski areas in Tahoe there is no lack of views to choose from. While some of the North Shore slopes get all of the fame, it is the south shore hills that are close to the waterline that offer fantastic views, even if you dont feel like strapping on your board or stepping into your skis. Heavenly, split between California and Nevada is conveniently located at Stateline. Lamost no matter where you are on the hill you have a great view of the lake. Even the gondola ride up the mountain offers a world class view of Lake Tahoe. Diamond Peak is fully located in Nevada but has some of the best views ever! 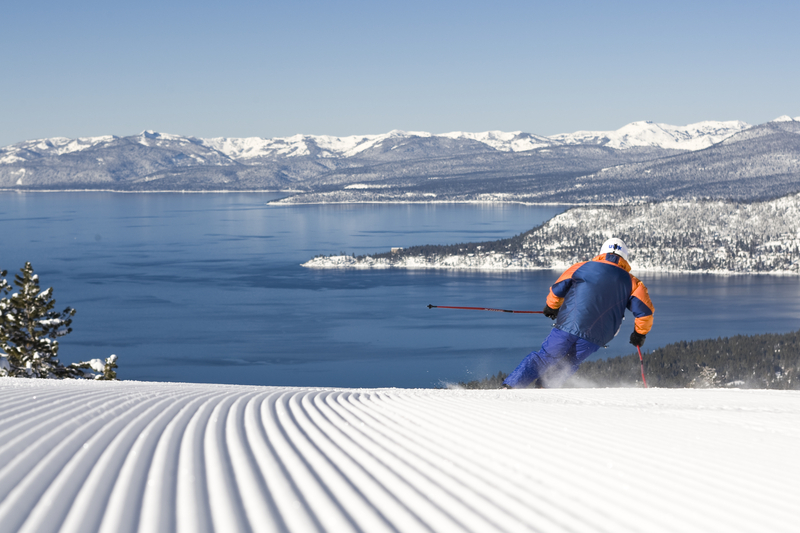 easy and well groomed trails offer an experience like no other – feel as if you’re going to ride right into Lake Tahoe. Homewood is on the smaller side, but being so close to the lake makes these moutain tops prim viewing points. As the closest ski area to the lake, Homewood promises epic scenes from anywhere on the mountain. If you are planning to spend an extended period of time in South Lake Tahoe, we promise your days are packed with adventure, new experiences, and tons to do. With skiing, snowboarding, snowmobiling, boat rides, fishing, hiking, and a multitude of additional outdoor activites, you are sure to never experience a dull moment. But one place that is not to be missed is just on the other side of the lake in North Shore. New kids on the block include Marg’s Taco Bistro (www.margstacobistro.com) and Morgan’s Lobster Shack (www.morganslobstershack.com). For pizza and salad, Best Pies (www.bestpiestruckee.com) can’t be beat. 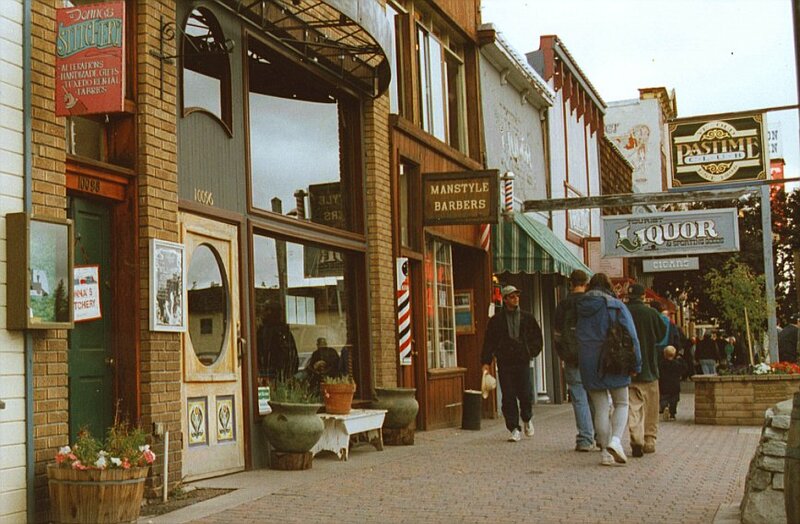 Fine-dining venues on downtown’s main drag include Restaurant Trokay (restauranttrokay.com), Dragonfly (www.dragonflycuisine.com) and Pianeta (pianetarestauranttruckee). A short drive away are the stellar Stella (www.cedarhousesporthotel.com/stella), the historic Cottonwood Restaurant & Bar (www.cottonwoodrestaurant.com) on a hill above town, and the elegant Lodge at Tahoe Donner (www.tahoedonner.com/the-lodge). Catch live music at Moody’s Bistro Bar & Beats (www.moodysbistro.com), Bar of America (www.barofamerica.com), Cottonwood (www.cottonwoodrestaurant.com) and other downtown venues. The Truckee Ice Rink (www.tdrpd.com) in Truckee River Regional Park, a half-mile from downtown, offers public skating daily. Woodward Tahoe (www.woodwardtahoe.com) at Boreal, about 20 minutes west of Truckee on Interstate 80, is an action-sports training center with trampolines, BMX/skate park, skate/ski ramps and programs for all ages. Northstar California (www.northstarcalifornia.com); purchase tickets online three or more days in advance for best deals. Sugar Bowl (www.sugarbowl.com) now sells one-day advance-purchase tickets at a discount. Squaw-Alpine (www.squaw.com; www.alpinemeadows.com) offers skiing at two resorts on one ticket; check websites for discount deals. For more short-notice discount deals, check in with Liftopia.com andGetSkiTickets.com. Tahoe Donner Cross-Country (tahoedonner.com/cross-country), with 100 kilometers of groomed trails, is about 15 minutes from downtown Truckee. The Truckee River Legacy Trail (www.legacytrail.org) includes a paved, multiuse trail and a dirt path running 2.5 miles from Truckee River Regional Park northeast along the river. EVENTS: Rahlves Banzai Tour (www.rahlvesbanzai.com) is a skier- and boarder-cross event with an $80,000 purse; final sessions are March 8-9 at Alpine Meadows and March 15-16 at Sugar Bowl. Spectator access requires a lift ticket. 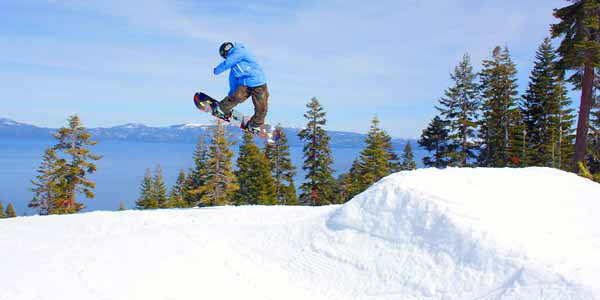 North Lake Tahoe SnowFest (www.tahoesnowfestival.com) features wacky events at various locations; through March 9. As spring time descends upon South Lake Tahoe the events just get better and better! We are ultra pumped for the great talent gracing South Lake with their presence. Hot on the indie music scene the Mowgli’s are appearing on March 8th, a must see for the next hottest band. Of course the Equinox Spring Festival on March 15th to celebrate Tahoe’s local Olympians, is going to a blast. And finally, the Spring Loaded Festival at heavenly in the end of March stretching through April. Check out our schedule of events and plan your trip to SLT stat! The Mowgli’s are an eight piece alternative rock band from southern California, known for their song “San Francisco”, which reached number 11 on Billboard’s alternative chart in 2013. The North Face Park and Pipe Open will be coming to Heavenly to pit the top local freestyle skiers against some of the world’s best. Join us to kick off the Equinox Spring Festival with a Golden Celebration, Solstice Plaza Grand Opening and Live At Grandview Music Series with The Nibblers! A procession will take the Olympians via fire truck from South Tahoe High School, onto Highway 50, past the airport and through the town of Meyers, concluding at Sierra Resort. Community members can line Highway 50 along the route and cheer the Olympian procession as it drives by. High-energy tribute band, Bruce in the USA, in the South Shore room at Harrah’s Lake Tahoe. This year’s films combine stellar film making, beautiful cinematography and first-rate storytelling to inform, inspire and ignite solutions and possibilities to restore the earth and human communities while creating a positive future for the next generation. Festivities include Unbuckle Apres Parties, the Gunbarrel 25, Red Bull Snow Warz, and more! Dire Straits’ legacy is alive and well thanks to the musicians who made history with the band. The Straits features members of the original line-up, performing songs from Dire Strait’s discography. For fans that have missed one of the best-loved groups of the eighties, The Straits offer a fantastic musical experience! 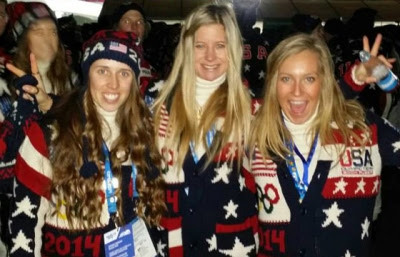 You may know these names; Jamie Anderson, Maddie Bowman and Hannah Teeter, all South ake Tahoe residents and 2014 Olympic athletes. All of these ultra talented stars have medaled in their respective events. On March 15th, 2014 South Lake Tahoe residents will honor these three Olympic athletes. The ladies will travel by fire truck from South Lake Tahoe through Meyers (hometown to all three) and onto the Sierra at Tahoe resort. Community members can watch this parade on highway 50 begining at 1:00 PM. Set up early to catch a glimps of the Tahoe Trio and cheer loud as these ladies cruise by in style! On the California side of Heavenly Ski Resort in South Lake Tahoe, a young bear was rescued on March 3rd. Due to the drought and strange weather patterns in Lake Tahoe this winter. The bear, who would normally be in hibernation at this time of the year, wandered on to the Heavenly ski runs, causing a portion of the hill to be closed for several hours. The young bear was rescued and found to minor injuries and was slightly underweight for a bear of his age. Officials say this is no doubt related to the current weather patterns and they say, even more bears and other sorts of wildlife are likely to appear in places they normally wouldnt at this time of year.